The next generation of the popular, affordable TP Series of pistols! The original TP9 set the benchmark for value and performance in a polymer pistol… and now, it's back and better than ever with a number of improvements engineered for the American shooter. 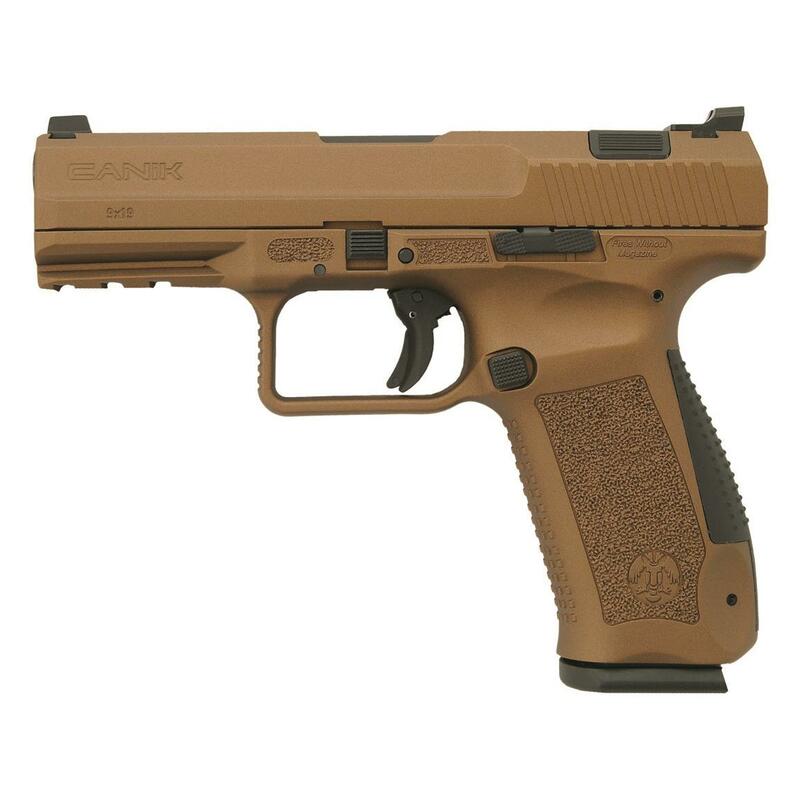 The TP9DA replaces the original trigger, slide, and frame assembly with upgraded versions, including a top-slide-mounted decocker. The double/single action (DA/SA) trigger features a long, heavy double-action pull on the first critical shot, followed by a much lighter, softer single-action pulls on subsequent shots. A double-action pistol offers more layers of safety on the first shot since its longer length of pull gives you an extra split second of decision-making in high-pressure self-defense situations. The trigger has a very short reset, and features a trigger safety that only deploys in single action mode. The slide now features the new profile, making for a better target picture when looking down the sights. The slide is finished in Burnt Bronze Cerakote for premium corrosion resistance, and comes outfitted with Warren Tactical® sights. Century Arms Canik TP9DA, Semi-Automatic, 9mm, 4.07 Barrel, Burnt Bronze, 18+1 Rounds is rated 5.0 out of 5 by 2. Rated 5 out of 5 by David5 from Fantastic Firearm I use this as my open carry firearm, when I do open carry, and it is perfect for it. I highly recommend this to anyone. So far no problems and for the price... You just cant beat it! Rated 5 out of 5 by Zach561 from Great gun for the Price! I would definitely give this gun a 5 out of 5 any day. Comes with everything you need and an extra 18 round mag and a very nice holster in my opinion. Took it out shooting for the first time today and it was dead on at 50 yards. I hit 17/18 and the miss was my first shot because I wasn’t sure how the sights were set. One of my favorite features is the decocker hands down. The color is absolutely beautiful, very hard to scratch the finish. Hands down one of the best pistols I own. Will definitely be getting another one in the future. If you’re looking for a quality gun at a budget price then look no further. Sportsman’s guide is always my go to for my guns. The 4-pay feature also makes this an amazing buy. You don’t even have to pay the full amount before you get the gun, once you make the first payment it’s shipped. Hope you guys enjoy this gun as much as I have!